(krĭpt) [Gr.,=hidden], vault or chamber beneath the main level of a church, used as a meeting place or burial place. It undoubtedly developed from the catacombs used by early Christians as places of worship. Early churches were commonly built over the tombs of martyrs. Such vaults, located beneath the main altar, developed into the extensive crypts of the Middle Ages that in many churches of the 11th and 12th cent. occupied the entire space beneath the sanctuary. At Canterbury the 12th-century crypt forms a large and complete lower church in itself. The crypt of the Rochester Cathedral is partly above ground. The cathedrals at Chartres and at Bourges have crypts typical of the Gothic development. A story in a church, below or partly below ground level, and under the main floor, often containing chapels and sometimes tombs; a hidden subterranean chamber or complex of chambers and passages. (1) In ancient Rome, any vaulted area of a building, wholly or partly underground. (2) In Western European medieval architecture, a chapel under a church (usually under the altar) used as a burial place of honor. 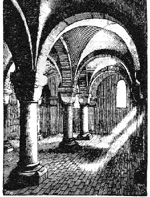 Crypts were widespread in early medieval architecture. the interior chamber of a tomb, usually partly underground, intended for the interment of the deceased. What does it mean when you dream about a crypt? In a dream a crypt or a catacomb can represent the womb. Alternatively, a space beneath the ground often represents the unconscious mind. (See also Burial, Coffin, Dead/Death, Grave, Hearse). A follicle or pitlike depression. 1. A story in a church below or partly below ground level and under the main floor, particularly of the chancel, often containing chapels and sometimes tombs. 2. A hidden subterranean chamber or complex of chambers and passages. 1. a cellar, vault, or underground chamber, esp beneath a church, where it is often used as a chapel, burial place, etc.